LINCOLN, Neb. (AP) — The shot clock was about to hit zero when Ohio State’s Luther Muhammad launched a shot from behind the key. The ball hit the front of the rim, bounced off the backboard and dropped straight through. 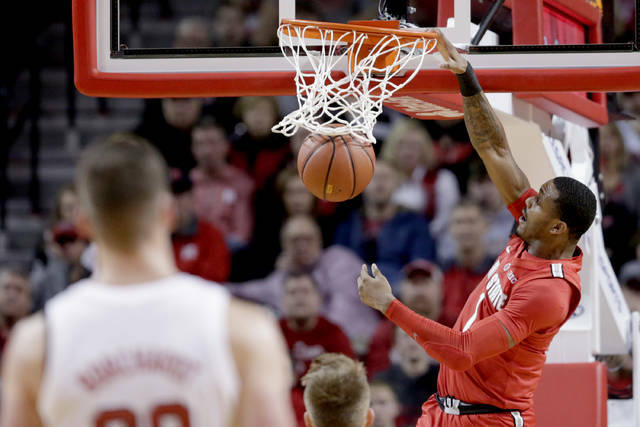 That funky 3-pointer — Muhammad’s third in a five-minute span of the second half — stemmed the momentum Nebraska was starting to generate and helped carry the Buckeyes to a 70-60 win that ended their longest losing streak in 21 years. Muhammad scored 18 of his career-high 24 points in the second half, including two other 3s during a 20-5 run that propelled the Buckeyes (13-6, 3-5 Big Ten) to their first win in six games. James Palmer and Glynn Watson Jr. combined for 37 points to lead the Cornhuskers (13-7, 3-6), who have lost three straight games and five of seven. Nebraska played without Isaac Copeland for all but a minute of the second half after he landed awkwardly when colliding with an Ohio State player under the basket. The athletic department announced Saturday night that Copeland tore the anterior cruciate ligament in his left knee and is out for the season. Ohio State started breaking open the game after Nebraska took its last lead, 38-36. The Buckeyes badly beat the Huskers on the boards, 45-31 overall and 14-7 on the offensive end. 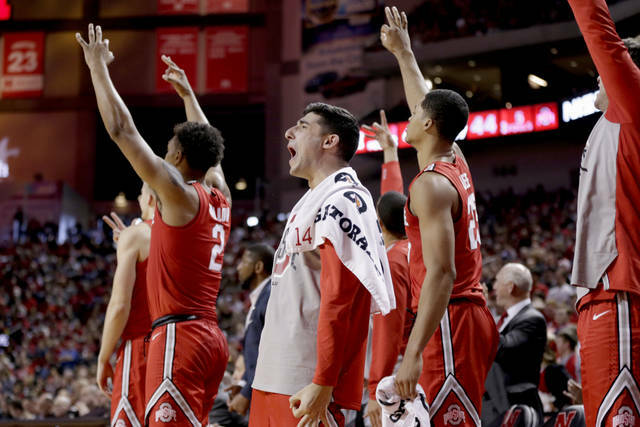 Disgruntled fans gave a sarcastic cheer when Nebraska got a long rebound of a missed Ohio State 3-pointer with about 6½ minutes left. A good number of them walked out at the next timeout. Nebraska went 6:19 without a field goal in the second half against Ohio State’s 2-3 zone and without Copeland on the floor. “I hear the groans. I’m groaning. It makes me sick,” Huskers coach Tim Miles said. C.J. 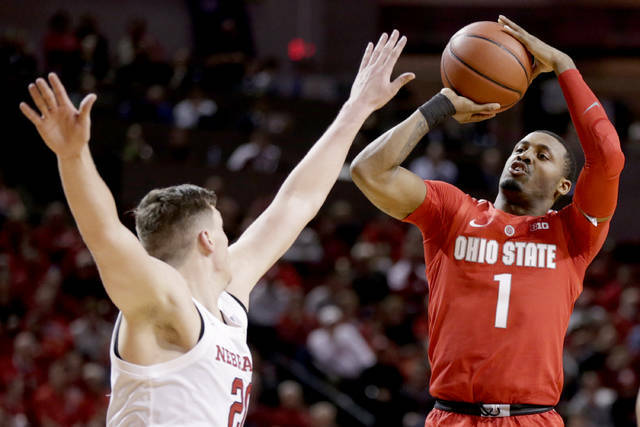 Jackson and Andre Wesson scored 10 points apiece for the Buckeyes, and Kaleb Wesson had 11 rebounds to go with his seven points. Palmer had 19 points and Watson had 18 for the Huskers, who shot 36.2 percent from the field. Ohio State: The Buckeyes played like a desperate team, bringing the game to the Huskers to end their longest losing streak since 1997-98. Muhammad played his best all-around game with six rebounds, two assists and three steals to go with his 24 points. Nebraska: The Huskers are nothing like the team that won 11 of its first 14 and cracked the top 10 in the NET rankings. They put a lot of emotion into their home game against Michigan State last week, and that 70-64 loss seems to have resulted in a long hangover. A road loss to Rutgers on Monday and Saturday’s loss to the Buckeyes made for a horrible week for Miles. Copeland tore the ACL in his left knee a minute into the second half. The senior forward, who scored eight points, was the Huskers’ second-leading scorer for the season, averaging 14.3 points per game. “I didn’t necessarily look at as whether you lose one game or five games. It’s miserable. Obviously, the misery was compounded five times. I don’t look at this as fun times are here again. We’ve got to continue to be tough-minded.” — Holtmann, on the end of the losing streak. Ohio State visits No. 5 Michigan on Tuesday. Nebraska hosts Wisconsin on Tuesday. Ohio Wesleyan University junior Cirrus Robinson (Columbus/Ashland) and junior Claire Sterling (West Jefferson) have been named North Coast Athletic Conference Players of the Week for the week of Jan. 28, it was announced by the NCAC. Robinson, a member of the Ohio Wesleyan women’s track & field team, was named Women’s Field Event Athlete of the Week, while Sterling, a guard on the Ohio Wesleyan women’s basketball team, was named Women’s Basketball Player of the Week. Robinson won the high jump by clearing 6-8¾ at the Dr. William Taraschke Team Challenge on Saturday. The mark tied the school record she set in 2017 and is tied for the top performance in NCAA Division III this season. Robinson also led off the Bishop 1600-meter relay team, which won its event in 4:16.94 — a margin of nearly 5 seconds — and anchored the 800-meter relay team, which finished third in 1:47.97. Ohio Wesleyan finished third in the 6-team meet. Sterling recorded a double-double in Ohio Wesleyan’s 68-59 win over Hiram on Saturday, finishing with 21 points on 9-of-12 shooting and grabbing a career-high 16 rebounds. She had 6 points during the first quarter as the Bishops built a 10-point lead, and nearly completed a double-double during the first half, finishing the second quarter with 12 points and 9 boards, before hitting a pair of free throws during the final minute to help Ohio Wesleyan close out the win. NORFOLK, Va. (AP) — The memory is etched in the mind so clearly, that split second when the huge buck walked out of the thicket. The joy back at home, admiring the take before butchering the animal for steaks, roasts, sausage and burgers, is something that never will be forgotten. It will help when the deer, from its shoulders up, is hanging on the wall in all its splendor — so lifelike that it seems that moment in time was happening all over again. Taxidermy is a centuries-old way to preserve parts or all of an animal that is especially popular in the fishing and hunting communities. While fish mounts have migrated from using the animal’s skin to fiberglass reproductions, mammals and birds have remained the real thing. Typically, only the eyes are not part of the animal, although some mannequin companies have perfected life-like teeth and mouth interiors. In this neck of the woods, white-tailed deer and black bear are the bread-and-butter for most taxidermists. Turkey mounts also are popular, and taxidermists are seeing more wild hogs. “It’s an exciting time to be a taxidermist,” said Robbie Anderson, president of the Virginia Taxidermist Association, a group that puts on one of the East Coast’s biggest conventions and competitions in March. “It’s a constantly changing world and there are so many innovations that are making the mounts more and more lifelike. Some taxidermists are even replicating moisture droplets in a deer’s nostrils. While full-body mounts are nothing new, there has been a growing trend of placing the animal or fish in an environmental situation, adding more realism. For the last 28 years, self-taught Tim McMahon has run East Coast Taxidermy near Elizabeth City. Like many in the region, he specializes in deer and bear. He’s also done quite a few exotic animals killed abroad. “It was all trial and error at first,” the 47-year-old said. “I bought all the catalogs I could get my hands on. I drove hundreds of miles to taxidermy shops that I could get into and watch the guys work. It just kind of clicked for me and seemed natural. The basics are simple. A hunter brings in, say, a deer head with a good bit of the skinned-out body, which the taxidermist tans to preserve. All of the inside of the head is removed before tanning. A foam mannequin is purchased and customized to get it as close to the exact size as the deer, then the skin is draped over the form. “Then it’s all about the small details,” McMahon said. It helps to have an eye for what the animal looks like in nature, something that taxidermists say gives hunters and anglers a distinct advantage. Knowing a little bit about an animal’s anatomy doesn’t hurt, either. “I wouldn’t say you have to be an expert, but it sure helps,” said Bill Clark of Open Acres Taxidermy in Virginia Beach. Clark took a different route than McMahon, instead heading to Indiana and learning the basics from when a deer was brought in all the way to when it was handed over to a customer. His teacher was a Grand Master taxidermist. He immediately entered some of his work in contests to gauge how good he was getting. He sought more influence when he returned home to start what has been a 15-year career. McMahon agrees that working long hours — especially when deer start coming in — is the only way to make money. “You can work a few hours a day and make a little money, or you can work 12-hour days and make it a living,” said McMahon, who said he charges about $585 for a standard deer shoulder mount. “But I love it, I think anybody that’s doing it does. CANTON, Ohio (AP) — In the workshop behind his Perry Township garage, Bob Hanley brings dead critters to life. Not a literal, “It’s alive,” Frankenstein-style reanimation. Hanley’s handiworks are very much dead. They only appear life-like. Hanley is a taxidermist — a trade that is part sculpture, part upholstery and part leatherwork. He has a taxidermy diploma on the wall but taught himself most of what he knows about mounting trophy fish, birds and quadrupeds. Hanley, 63, runs Bob’s Taxidermy out of a simple workshop. Ohio’s deer season ends next month, and his project on a recent morning was a 12-point buck. Each deer mount starts with a hide from a butchered deer, and if it’s a buck, the antlers. Hanley tans the hide and removes the flesh, a process that takes several days. He also grooves and shapes a foam form that gives the finished trophy the right shape. Clay around the eye sockets and other parts of the face and stiff liners inside the ears give the mount subtle muscle tone and attitude. Hanley spent a couple of hours getting the hide onto the mount, but the buck’s face still looked like a ragged mask — lips agape, eyes and nostrils just empty holes. But a few more hours of work would transform it. Hanley’s fingers flew as he stitched the thick hide together with heavy string and a 3-inch-long needle, careful not to trap hair in the stitch or leave a gap in the conversation. Hanley talked a lot. About his dogs and his granddaughter, about the concrete Bigfoot someone pinched from his front yard and the orange, furry thing that he captured on his game camera near Sandy Valley. About faith and getting saved. There are more than a dozen fish mounts on the south wall of his shop and even more land animals — boars, deer, sheep, a turkey, a bear — on the north side, and a story with each. Hunting boar at Ted Nugent’s ranch in Michigan. (“I’ve got his autograph over there somewhere.”) The big muskie his daughter caught at Leesville Lake on a stormy day. “I built my business on fish, I don’t want to do it anymore,” Hanley said, explaining that mounting fish is hard on his hands, but it’s how he first learned his craft. Hanley said he always had an interest in preserving animals. When he was a kid growing up in Canton, he tried to pickle mice in alcohol. It didn’t work. He took his first stab at taxidermy after a fishing trip in the 1970s. He had caught a 5-pound bass and wanted to keep it as a trophy. His fishing buddy told him how to mount it. Hanley used a marble for the eye and filled the fish with the innards of a stuffed animal and a coat hanger. He’s not sure where it went; he probably threw it away. “I wish I still had that fish,” Hanley said. Taxidermy remained his hobby until the early 1990s, when he made it his livelihood after the plant where he worked closed. Hanley said it took him a long time to learn taxidermy. He did a home study course, watched videos and took a class on mounting turkeys, but learned the most by watching animals, be they his dogs, deer in the woods or fish in a lake. How do they hold their mouths? How do they move their eyes? How does the fur whorl? How do the scales iridesce? As Hanley talked, he pulled the hide over the nose of the foam form, smeared it with glue, trimmed the lips, nostrils and eyes, and carefully tucked away the extra skin. The ragged mask was gone. Around this point, Hanley usually took a break so that he can look at the mount with fresh eyes to make sure he hasn’t missed a flaw. He still had to paint the mount, adding a little pink in the ears, nostrils and around the eyes, and some tiny bumps on the nose, to bring it to life. Hunters have killed more than 165,000 white-tailed deer so far this hunting season and archery season closes Feb. 3. The tiniest fraction of that harvest ends up in Hanley’s workshop on Whipple Avenue SW, and he said that’s OK.
With almost 30 racks hanging in the back of the shop with tags, each one representing a customer’s buck, he has plenty of work to see him through to next deer season. Hanley is one of several taxidermists in the area. He doesn’t claim to be the best. He doesn’t enter competitions. He charges $390 per deer. “I just want to make a living,” he said. Besides hunting and fishing trophies, people contact him with all kinds of crazy requests: Hamsters, iguanas, dogs, cats, groundhogs. One lady asked him if he could taxidermy a cat that had been buried three days. No, he couldn’t. Another time, a man hired him to mount a lobster. “He wanted it done,” Hanley said. Hanley has had a few apprentices over the years, but they didn’t stick with it. People think taxidermy is easy money, but building your own business is tough, he said. Some days, the hide doesn’t want to fit on the mannequin or something else goes wrong. And the ticks have gotten so bad that Hanley wears a protective suit sprayed with repellant when he handles the raw hides. Hanley spun the mount around on his work stand once again. BALTIMORE (AP) — The Baltimore Orioles want fans to understand their 2019 season isn’t necessarily about making the playoffs. For a franchise focused on the future, the most important “P” word is patience. New general manager Mike Elias and rookie manager Brandon Hyde cautioned Saturday there will be no quick fix for a team that underwent a complete overhaul during and after the worst season in Orioles history. The roster was gutted in July, and vice president of baseball operations Dan Duquette and manager Buck Showalter were subsequently dismissed in November after Baltimore staggered to a 47-115 finish. Sitting side-by-side on a stage at FanFest — the annual winter event for the team’s ardent backers — Elias and Hyde cautioned the turnaround may not be quick. They explained the goal this year is to further the rebuilding process. The message was a departure from the previous six years, when Duquette and Showalter spoke enthusiastically about reaching the postseason. Now it’s up to Elias and Hyde to assemble a team capable of bringing Baltimore its first World Series victory since 1983. Elias and Hyde are quite familiar with the rebuilding process, which is exactly why they’re together in Baltimore. Fans appear to be on board. Many of the estimated 8,000 people in the Baltimore Convention Center seemed thrilled over the prospect of seeing a young team develop before their eyes. “It’s just as many people that always come here, and everybody is really excited,” outfielder Trey Mancini said. Though Orioles fans loved Showalter, they’ve been quick to embrace his successor. Elias hasn’t done anything significant in free agency, but he didn’t dismiss the possibility of getting involved in the weeks ahead. Not even Adam Jones is off the table. Jones pretty much said farewell to Baltimore in the season finale last year, but the outfielder remains a free agent and Elias didn’t dismiss the notion of a return. The Orioles are so young now, Mancini is considered to be a veteran despite having only two years of experience. INDIANAPOLIS (AP) — Kicker Adam Vinatieri has signed a one-year contract with the Indianapolis Colts. General manager Chris Ballard announced Friday the two sides had agreed to terms on a new deal. Vinatieri made it official with his signature Monday, then told reporters he was glad the process went smoothly and ended early. At age 46, he will again be the league’s oldest active player next season. If he plays beyond his birthday on Dec. 28, he would join George Blanda and Morten Andersen as the only 47-year-olds to appear in an NFL game. Vinatieri has four Super Bowl rings. He begins next season as the NFL’s career scoring leader with 2,600 points and career leader in field goals made with 582.